Washington, Dec 5 (Just News): As part of a U.S. government-wide effort to combat corruption and facilitate asset recovery, the United States is co-hosting with the United Kingdom the inaugural Global Forum on Asset Recovery (GFAR) at the World Bank headquarters in Washington, D.C. from December 4-6, said a press release of the White House. 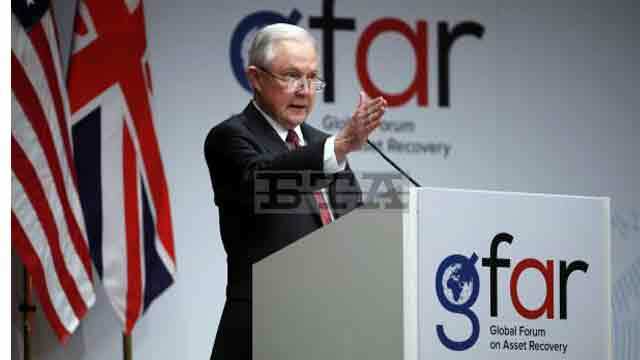 U.S. Attorney General Jeff Sessions delivered the opening remarks at GFAR on Monday afternoon. GFAR was announced at the 2016 London Anti-Corruption Summit. The forum aims to facilitate the recovery of stolen assets from four countries – Nigeria, Sri Lanka, Tunisia, and Ukraine – by convening more than 150 law enforcement officials, prosecutors, and financial center representatives to discuss ongoing asset recovery cases related to the four focus countries. Approximately 20 countries are expected to participate. The United States is committed to fighting corruption internationally by cooperating with foreign partners to trace and recover public assets stolen by kleptocratic regimes and to prevent corruption before it starts. In addition to the corruption and money laundering prosecutions and asset recovery cases brought by the Department of Justice and its law enforcement partners, the State Department and USAID support a wide range of foreign assistance programming to counter corruption, including: building capacity of foreign governments to create stronger laws and more effective institutions; investing in the ability of civil society and journalists to hold governments accountable; supporting investigations and prosecutions, for corruption offenses; and promoting measures to prevent corruption, foster oversight, and promote government integrity and transparency. These efforts are critical to addressing the corrosive effect corruption has on global security and prosperity. This event is part of the Department of State’s commemoration of International Anti-Corruption Day on December 9.